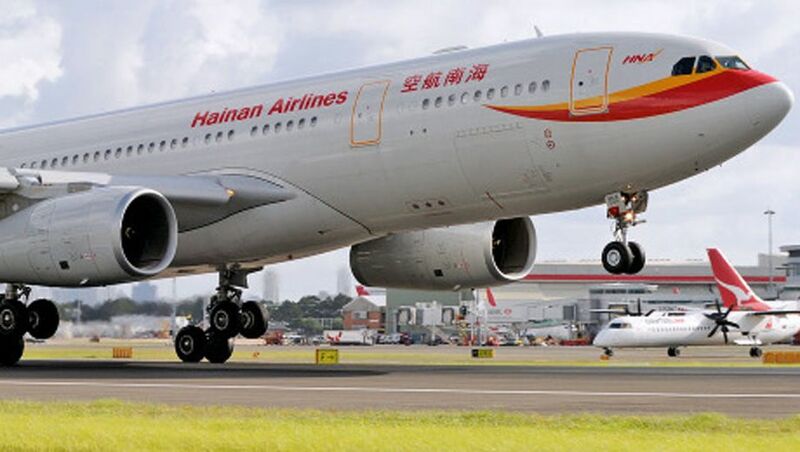 UPDATE | After previously listing new Brisbane-Beijing flights in its booking schedule, Hainan Airlines is swapping out Beijing in favour of Shenzhen, with non-stop flights planned to commence from September 20 2017. Curiously, timings of the new Brisbane-Shenzhen flights mirror the original Brisbane-Beijing plans – including with the same departure and arrival times, flight durations, weekly schedule, aircraft type, and even the same flight numbers – giving the appearance that the airline originally loaded Beijing into the system in error. "BAC welcomes Hainan to Brisbane and we look forward to partnering with them to make the route a success, further strengthening the ties between China and Queensland," said Brisbane Airport Corporation CEO and MD, Julieanne Alroe. As with Beijing, passengers cannot yet purchase seats on these flights as the corresponding fare types and availability have not yet been unlocked. PREVIOUS | Virgin Australia partner Hainan Airlines is planning to launch non-stop flights between Brisbane and Beijing later this year. An official start date is not yet confirmed, although the airline’s flight schedule database shows the first Beijing-Brisbane flight to be pencilled in for September 20 2017 with the first Brisbane-Beijing flight the next day on September 21. Served by an Airbus A330-200 aircraft with business class and economy, flights would run twice-weekly in each direction, with HU412 departing Brisbane at 11:30am on Mondays and Thursdays to reach Beijing’s Capital Airport at 6:40pm the same evening. On the return, HU411 is wheels-up at 10:35pm on Wednesdays and Sundays for a 9:30am touchdown in Brisbane the following morning. These flights are beginning to appear in airline GDS systems, but all queries performed by Australian Business Traveller returned ‘zero fare availability’ – which means travellers cannot yet purchase tickets on these flights, even though they technically appear in the system. This is a similar approach as was taken by Japan Airlines prior to its announcement of non-stop Melbourne-Tokyo flights last month – with the airline loading ‘zero availability’ flights into the booking system initially and unlocking fare purchases only after an official announcement had been made. Although Hainan Airlines is part of the HNA Group, a part-owner of Virgin Australia, it's not known whether Virgin Australia Velocity members will be able to earn and redeem Velocity points on Hainan Airlines flights, or whether Virgin Australia will codeshare on these flights. The time is not perfect but OK.
BR did 2 days per week schedule for a while and gradually increased it. Most airlines are very cautious when they enter BNE market. They test the water first and if profitable they'll go daily. It's changed to SZX-BNE now. Yeh. They are starting SZX-BNE instead. They don't even fly to Beijing capital. The schedule is exactly the same. 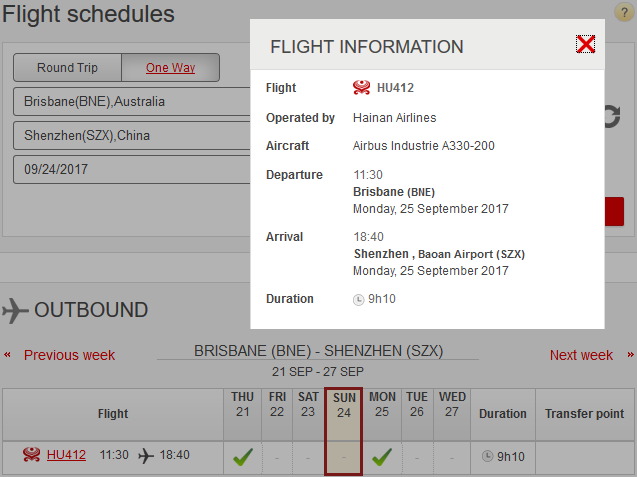 Comment on "Hainan Airlines plans Brisbane-Shenzhen flights"